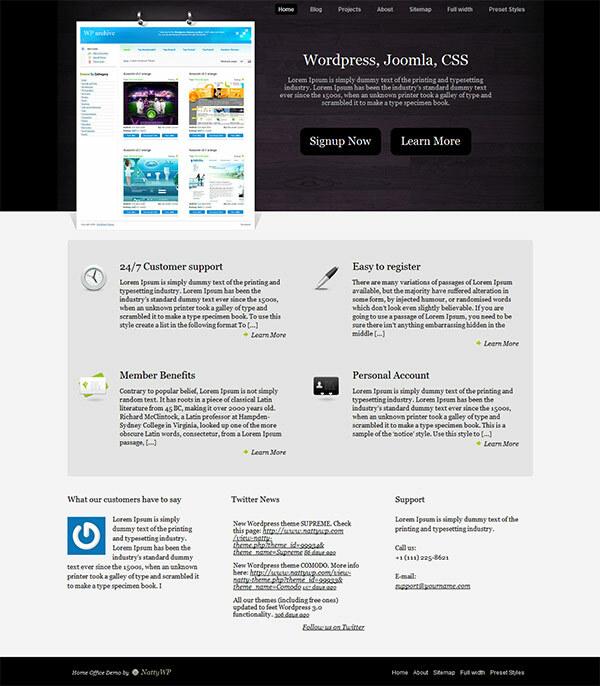 Home Office is a professional wordpress theme. Using this template you can showcase your business, services or promote your products. You have complete control over what to display on the home page, Blog or Projects pages. The theme has an amazing layout with 9 attractive color schemes lets you use it for a company website or to showcase special products, you can present a list of services or benefits of your company or product using special featured pages section on the home page. You can specify the pages to display in the Theme Options panel. There is a Special Projects section to display your latest projects or benefits, a networks widget for a blog section lets you display all the popular social networks, a completely widgetized sidebar with custom widgets included in the theme packaging, a completely CSS color controlled, offering you the most flexibility and the easiest customization, allowing you to change the colors of your entire site on the fly in seconds.